A 250 kilometre running event which takes place entirely within a landscape & environment used by NASA to test its Martian modules is never going to be light work. Come the end of 5 days of self sufficiency, daily running distances ranging between 40km and 74km per day, each and every one of us had learned a total respect for the terrain & conditions that Mother Nature can provide. The 4Deserts events organised by Racing the Planet are weeklong races split into 6 individual stages. Much like the Tour De France the race clock stops each day as you cross the finish line and the cumulative time for the week gives each runner or teams their overall position. The first 4 stages come one a day and usually feature distances around a marathon in length (42.2km). The fabled long day normally comes on day 5, spanning across into day 6 for those towards the slower end of the field. The sensation of finishing the long day is something that can only be appreciated by those who have put themselves through the huge mental and physical test required to get there. In many ways there is a moment of serenity on crossing the finish line. At once it seems that all the hunger, thirst, pain & anguish is washed away to be replaced by serenity and peace of mind that you are on the brink of achieving something that really will stay with you forever. As I stood on the finish line of the long stage clapping the last 3 competitors into camp including a blind man being led by his son, I couldn’t help but feel incredibly emotional. It was an overwhelming occasion for two reasons. Whilst it is no longer so uncommon these days to see someone overcoming adversity in everyday life, witnessing it first hand and in such an environment is extremely moving. Coupled with this the fact that physically and mentally at such a moment you yourself are on the edge emotionally it really hits home just where you are. The second reason is that I have always felt it is at that moment that the race is over. You can finally reflect on what you have achieved and the sheer amount of pain and anguish you have gone through to reach what is a moment of exceptional achievement. Whilst this may appear to be presumptuous given that one stage still remains, the 10km finishing run a day later is, for 99% of the field, entirely processional. This was my third desert (second in the 4Deserts series), following the Marathon Des Sables in 2006 & the Gobi March in 2007 & each has provided me with a thousand memories that remain as clear as day, but always with one seminal moment belonging to each. In the Marathon Des Sables of 2006 a British ex pat residing in Singapore, CEO of one of the worlds major banks crossed the finish line of day 3, walked over in floods of tears and embraced me, in the words of my running partner Jimmy Corrigan, ‘like a son’. I had met him on the plane on the way out and exchanged a few words in conversation but that was it. It is unlikely he will ever be able to accurately describe how he felt at the end of that day but at the time I knew and it was a humbling thing. In China 2007, 65km into the long day with the light fading, the stars over my head stumbling around trying to stay awake I again had my little moment where it all came together. Forgetting the ‘bling’ at the finish line & the fact that you have the accomplishment with you forever, each event has also left me with respect for everything you take for granted in day to day life. 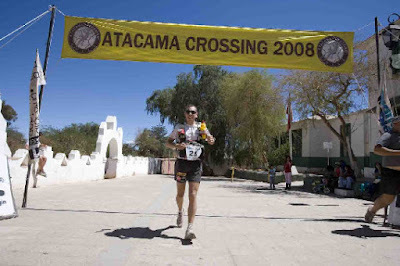 Training for the Atacama Crossing started for me the minute I finished my first 4Deserts event, the Gobi March in June 2007. By nature I am a very competitive person when it comes to sport & whilst I had gone to Morocco and China with the intention of simply finishing, when I completed the 80km fifth stage of the Gobi in strong fashion I had unknowingly opened myself up to the question of how much better I could do. On my return it took less than two weeks for me to enter the Atacama in April 2008. Over the months leading up to Christmas I kept up a steady stream of training doing reasonably well at the events I entered. Over Christmas I then wrote a training schedule for the 12 weeks of 2008 leading up to the event which I knew would stretch me further than I had stretched myself before. The culmination of this was running two 6 day weeks of 2 hours per night with pack at full race weight. Mentally this helped enormously. Coming into a 6th half marathon of the week with a heavy pack on your back in the freezing rain of a London winter’s night you need to be tough & this undoubtedly stretched my idea of what training hard was really all about. When we all arrived in Calama, northern Chile, I felt pretty good but with no understanding of how my fitness compared to the other competitors. After 37 hours of travelling I reached the hotel & hooked up with the boys. Pete Bocquet, Hully and Willo are like lifelong friends despite having only spent a week in their company before, with only one night in the ‘real world’. Frank & Erik ‘the Easy E’, one of our volunteers, were to fill exactly the same roles by the end of the week. I think these friendships are borne out of the simple act of suffering for a week. In effect they become ‘partners in pain’. For 4 days before the event we seemed to do nothing but laugh. Some of the other competitors & even the race directors might have wondered if it would stop come running time, however it was all in good spirit. n the start line. Two runners even went for a jog along the first section of the trail. To be honest those of us who’d run an event like this before saw this posturing as a little over the top. We all knew we were about to go through hell but to put on this kind of bravado was unnecessary. Worse than this, their activities no doubt left some of the competitors feeling even more nervous than they already were. Time would tell as to whether the characters behind this pre match bravado would last the test. I spent the first night with little sleep as I couldn’t get warm enough. At 3200m Campsite 1 experienced temperatures around freezing during the first night. My bag was rated down to positive 5 centigrade and wasn’t equipped to keep me warm enough in the conditions, particularly as I was carrying very little fat at this point. Starting the following morning at 9am everyone quickly settled into their rhythm. I knew Team Trifecta would perform strongly, Pete, Mike and Frank are all extremely tough competitors who competed up the field in China and had come here to win the teams event. In the back of mind & from the first moment on I knew I had those guys as a safety net, running behind me each day &, rightly or wrongly, without talking to them about it, this would remaining the case throughout. I had decided prior to the event that I would run as much as I physically could, however if things went belly up it was great to know that such good friends were always close behind out on the course. If they were to come past me, at that point I would just try to hang on to them. As with all of these events the field became strung out very quickly on the morning of day 1. At the front of the field were pre race favourites Jimmi Olsen (Denmark) who had previously won the Sahara Race in 2006 & Dean Karnazes (USA) perhaps the world’s most renowned ultra distance runner. My race strategy in ultra’s has always been to walk every hill, saving energy & muscle fatigue plus a good strong power walk actually results in almost no lost time against a calorie draining jog. At that altitude and with the sand/ rocks under foot, running up the 14km of mini dunes to CP1 was out of the question for me. I simply stuck to jogging the flats and falling down the descents as quickly as possible. 10 or so runners were quickly off into the distance and I sat comfortably into a position just in front of Mimi Anderson, a British lady with an extremely impressive running CV and a bubbly personality. My primary goal coming into the race was to take home the trophy for the 20 – 29 age category. Secondary to this was finishing inside 40 hours and as high up the field as I could. I knew my main challenger for this crown would be Johann Boost, a British runner who took home the award from the Gobi Desert in 2007. I caught Johann heading into checkpoint 1 and decided to drop the hammer straight away in order to give myself a lead, which I could then protect. The 10km between Checkpoint 1 & 2 was simple enough despite a South African guy, Paul Liebenberg, who later became a great friend, running straight into me from behind (as if there isn’t enough room to pass in the desert) & I had so far balanced well my pace, nutrition and hydration. Glancing at the hr monitor and seeing an average of 178 (my peak is 205) scared me a little but I put it down to the altitude and pressed on. Things began to get better and better for me between CP2 & CP3. Over a series of dried river beds with broken rock, followed by a long uphill slog I went back past the South African, overtook a strong Italian runner as well as Jimmi Olsen whom sadly had injured both his ankles crossing the awful terrain. Coming into CP3 in 5th place I was struggling to keep calm and not blow the good day by hammering through the last 5km to camp. I managed to keep it steady and came in, in just over 5 hours for a great first day. I was immediately congratulated by a surprised Mary Gadams, CEO of Racing the Planet and I admitted to her that I had even surprised myself so early on. Day 2 began with a 10km section through slot canyons & a fair amount of time spent in the water. I have always relished these sections as whilst others concentrate on footing, keeping their shoes and socks dry or even changing socks I have always found simply ploughing on through works best. The scenery was incredible pushing on towards CP2 with a huge climb up and through a disused mine shaft followed by a drop down a 100m sand dune into the 2nd CP. Once again I started strongly giving myself a bit of a fright as I came past Dean Karnazes shortly after CP1. As a lover of the big hill climbs I was able to use this to my advantage, again catching Johann at the top of the climb & then raced through CP2 with a good lead on him. The next section was probably the most drawn out of the race. It became exceedingly hot pushing upper 30’sC & myself and German folk legend Joey Kelly traded positions for the remainder of the day. On reflection it may have been better to stick together but racing each other hard over the next 20km certainly pushed us both. In the end I made it to camp in 5th place once again, 4 minutes behind Joey who had quite severe heat exhaustion and required medical attention on finishing. Later that afternoon with competitors coming in very sporadically due to the tough conditions I wandered down to the nearby salt lake. Having a soak in the cool water, bobbing around on the surface due to its high salinity was great. That was until you stepped out at which point the salt instantly caused some horrendous chaffing, particularly in my already sore behind! Day 3 kicked off with our first section of the dreaded salt flats. As we ploughed through an area of tall grass the field stayed much closer together & for the next 20km to CP2 it was strong & close running. I left the second checkpoint in 8th place but quickly passed the Chilean national team who were almost stationary in the horrendous salt flat area between CP2 & CP3. Many people have tried to describe what running or more likely walking on this landscape is like. Best, in simple terms, it is like running across a coral reef minus the water. I repeatedly kicked rocks into the rear of my calves with my trailing leg. This did wonders for the already badly sunburnt skin. Nevertheless I persisted on passing an Italian competitor and again made CP3 in 4th place despite stopping three times with stomach problems. CP3 to CP4 went on forever across rolling dunes, ending in a small section of climbing just prior to the finish. Nicola Bennetti, another strong Italian competitor, passed me during the final stage and as hard as I pushed he always seemed to be around 200m ahead the whole way into camp. On arrival I was greeted with a mandatory kit check of food stocks, emergency gear and mandatory equipment (which I passed) and for the first time ever in any race, headed over to the medical tent. The main reason for this was that when removing my shoes and socks I had inadvertently torn off two fresh toenails. A quick removal job followed by burning the skin with hydrogen peroxide rendered the toes as good as new and I was amazed at the difference. Never again would I be so against seeking help from the Docs! By this point in the race Team Trifecta (Frank, Hully & Willo) had built up a small lead over the warring Chileans. I couldn’t help but feel for one member of their team as he was very obviously being dragged along at a ridiculous pace by the two quicker local runners. Passing him in tears each day was a real low point and on seeing them I always made sure to congratulate him on doing such a great job, ignoring the others who appeared to be barracking him for show and move on quickly so as not to get dragged into the psychological downer of being around the group. Had they worked as a team there was a very good chance they would have ended up beating our boys but Trifecta were solid as a rock each day. Sticking to a regime of run 7, walk 3 for each ten minute burst they found their rhythm and stuck to it. It was impressive to see how a well organised unit used their racing experience to manage the race to victory. What was not so impressive was an unnamed member of that team flooding the area under my sleeping bag with water during the night. It was quite an experience sleeping out under the stars though. In the end I was grateful. Day 4 was straightforward enough, aside from CP2 – CP3. The first 20km was a relatively simple and largely runnable gradual downhill slope and with everyone conserving energy for the long day, the pace was far from relentless. Shortly after CP2 we entered the salt flats. It felt very much like the race almost stopped for that section. You could see runners ahead and behind all moving at snail pace just trying to get through it in the best shape possible. Running was out of the question, twisted ankles and cut legs were the order of the day. I simply put my head down at this point, pulled out the ipod which I had brought for this one section in particular and ground out the 10km with the foo fighters blaring at me. Once again I passed the Chilean Team, with the two stronger runners shouting at the third much slower guy to hurry up, knowing full well that Team Trifecta were bearing down on them. After the horrendous section of salt I passed the Italian Italo Orru at CP3 and jogged into the finish in just over 7 hours. Shortly after I had gone through, the Trifecta boys also came past the Chileans and ended the Chilean fight for the lead. Later that afternoon the slower member of the group decided the pain of his feet had become too much to race with the two faster guys any longer and they disbanded to race separately for the last 2 stages. An horrendous day for many was then made worse when the weather closed in and destroyed the campsite. Whilst sitting in the tent sorting my kit a sand devil blew through and tore the tent from the ground with me in it. It felt like Armageddon as I fought to get out from the material being torn about me and as I crawled outside the race directors were shouting ‘get down get down’ with flying poles and tents everywhere. That was fine by me. Our tent stayed on the floor until it passed & with four of the tents completely destroyed and blown out across the salt lake, the boys from Team Trifecta and I quickly made our way to the media tent where which we made our home for the night. Before the start of day 5 I had a very careful look at the standings to see what I would need to achieve across the 74km in order to tick the boxes for the goals I had set myself. To my surprise and delight I was in 5th place overall, 4 minutes behind Joey Kelly in 4th and 3 and a half hours up on the nearest competitor in my age group. If I had a good day I would move into 4th and undoubtedly secure the ‘win’. If I hit the wall or had a bad one I would perhaps be looking at over-nighting on the course and could very realistically still lose everything I had worked for across the last 9 months. Starting out with the rest of the top 20 in a staggered start an hour after the slower runners had left camp, we ran straight into 13km of salt flats. Not an ideal way to begin running 75km. I went off hard straight away. I wanted to put time on Joey and make him work to catch me. I was also spurred on by the site of the slower group in the distance. As we began to pass the back of the field one by one it became painfully clear how slowly some of the competitors were moving. With shredded feet or injuries ranging from the mild to the severe it was inspiring to see people coping with whatever ailments they were suffering. At the agonising pace some were moving at it was going to be an extremely long day, if not two, yet they WERE moving and what’s more almost all of them smiled and clapped as we went past. By CP2 I had passed all but 1 of the runners from the slower group and began to move into a section of rocky desert. With the front group strung out up ahead I literally couldn’t see another sole for miles around. That was until Joey Kelly came roaring past. I had a bit of a down moment when Joey came through. I knew that I would have a job on my hands trying to beat him and get 4th but I hadn’t expected to relinquish the lead so early. Joey later told me that he had found it impossible to pass me over the previous 2 days. Each afternoon he had come up behind me and we had run together for a while before I had managed to find second wind and push on ahead once again. He wasn’t going to let that happen again. CP3 came after an enormous dune climb before dropping down to CP4 at the end of a dried river bed. At this point we had covered about 50km, Joey was well out of site and were left with 8km to CP5 and 12km to the finish. The 8km wasn’t too bad although I needed to visit the gents (side of the road) 5 times alone on this section alone as my stomach problems increased their intensity. I reached CP5 just as darkness was falling, changed into some long sleeved clothing, pulled out the headtorch and began tackling the 3km hill ahead. It always amazes me in these races how alone you can feel, not being able to see anyone behind you for miles and miles & yet how quickly people can come up behind you. At this point I was in 7th place & I knew if I could just push on at a steady 5km per hour I would have the trophy and 5th place within my grasp. Unfortunately things started to go badly wrong. I hit the wall in a big way as a direct result of my stomach problems which persisted and had real trouble walking in a straight line. I had reached my limit. Kashin from Singapore and Shane from Ireland came running past at what felt to me like 5km race pace and I was struggling to just keep moving. As I turned off of the road I used my old trick of resetting my watch every 10 – 15 minutes counting down the amount of time I had before I reached the finish. Basing it on 10 minute km’s I thought I would be ok.
Two hours later Nicola from Italy came up behind me and we walked together for the final 4km. Both he and I were toast. Nicola kicked a rock rather too hard and let out a scream of pain which woke me up from a dribbling stupor. As we descended a dry waterfall, two volunteers helping us down told us ‘just 400 yards from the second waterfall’. As we reached the second descent, Mary Gadams was there to help us with the hand and foot holds. When we checked how far to go, Marys response was ‘no more than half an hours walking’. Absolutely on our last legs, Nicola looked at me and then let out a tirade on poor Mary about how wrong the distance estimations had been. I felt like giving up there and then with the finish line almost in sight. As we stumbled on in silence I was irate and started to run again fuelled by nothing but adrenaline from the anger. Nicola joined me & in no time at all we crossed the finish line together in 11 hours and 50 minutes. The final competitors crossed the line to our applause over 24 hours after the start gun had gone off. When the blind Korean came through the tension over the camp from a weeks hard racing seemed to lift & thoughts of burgers, fried chicken, chips, cokes, beer and loved ones (in roughly that order) started to appear very close to home. As we enjoyed a few of those things that evening everyone started tending to feet for the last time & hitting the sack early in order to be on top form for the awards dinner the following night, as well as the small matter of the final 10km the following morning. Stage 6 of desert stage races have always seemed unnecessary to me & none more so than in this race when it was decided that the top 12 would start an hour after the rest of the field. I was hoping to be able to run with the boys from Trifecta and with them just outside the top 12 this was rendered impossible. Racing the Planet have provided me with unparalleled experiences and moments that I wouldn’t trade for any amount of wealth, however this decision plus the ‘waterfall incident’ did make me wonder if they would consider making small adjustments to the benefit of all in the future. As the last 12 of us set off we were chased by the course sweepers picking up the final pink route markers behind us as we went. It was surreal to know that the course was disappearing forever just a few paces behind us but also frustrating in that I felt like I was being tested for pace by a German guy with no back pack and fresh legs. I ended up coming over the line 10th out of the 12 maintaining my 5th place overall and winning the age group. Team Trifecta took home the team award and Joey Kelly took home the age category 30 – 39 and ended up an hour ahead of me in 4th place. People always ask if I would recommend others to take part in stage racing of this nature. My answer is always the same. If you train & are in any sort of shape coming into the race, you will have what will remain forever as one of the best & most unforgettable weeks of your life. There is no single part of it that isn’t worth it. All the pain you might experience on the race itself is washed away at the end and you are left with so much more than overcoming such a huge physical undertaking, not least pride, a sense of achievement, renewed vigour, strength of mind when returning to the real world & friendships you will keep for life. The only real danger can be that each subsequent race must try to live up to the one that has gone before & that is a lot to ask. In my experience they always have.